Left: Portland MAX LRT. (Photo: L. Henry). Right: Cleveland Healthline “BRT”. (Photo: GCRTA). Until recently, industrywide comparisons of performance between light rail transit (LRT) and the specific bus service mode of “bus rapid transit” (“BRT”), relying on reporting information in the National Transit Database (NTD) of the Federal Transit Administration, have been impossible because “BRT” data were not separately reported but instead were merely jumbled into the large general category of Bus. However, that has recently changed. A comparative analysis of these “BRT” data and available data for recent-era new LRT systems (defined as post-1970, roughly following the introduction of the LRT concept in the North American transit industry) indicates that new LRT systems continue to excel in the two most critical performance areas of ridership and operating and maintenance (O&M) cost per passenger-mile. New recent-era LRT systems included in this analysis are those in the following cities/metro areas: San Diego, Buffalo, Portland, San Jose, Sacramento, Baltimore, Denver, St. Louis, Los Angeles, Dallas, Salt Lake City, Minneapolis, Houston, Phoenix, Charlotte, Seattle, and Norfolk. However, New Jersey Transit’s Hudson-Bergen LRT (HBLRT) system, launched in 2000, could not be included in this analysis of totally new systems, because the data for HBLRT is combined with that of Newark’s legacy subway-surface LRT system in the agency’s NTD report. “BRT” systems with NTD data available include those in the following cities/metro areas: Cleveland, Eugene, Los Angeles, New York City, Kansas City, Las Vegas, and Orlando. Note that a number of important new “BRT” operations, particularly those in Pittsburgh, Miami, Seattle, Honolulu, Charlotte, Boston, and Ft. Collins, are not included because their specific data are not reported to the NTD. For more than two decades, proponents of “BRT” have pursued a virtual war against LRT with the mantra “just like light rail, but cheaper” — claiming that an array of rebranded and heavily promoted limited-stop bus services, deployed service applications similar to those of LRT, could offer all the benefits at far lower cost. Such claims can now be tested by comparing very similar relatively new installations of both systems. Derived from a comparative analysis of this data population, critical performance indicators are presented and discussed in the sections below. • Ridership — Certainly, average annual ridership is one of the most important indicators of a transit operation’s performance. 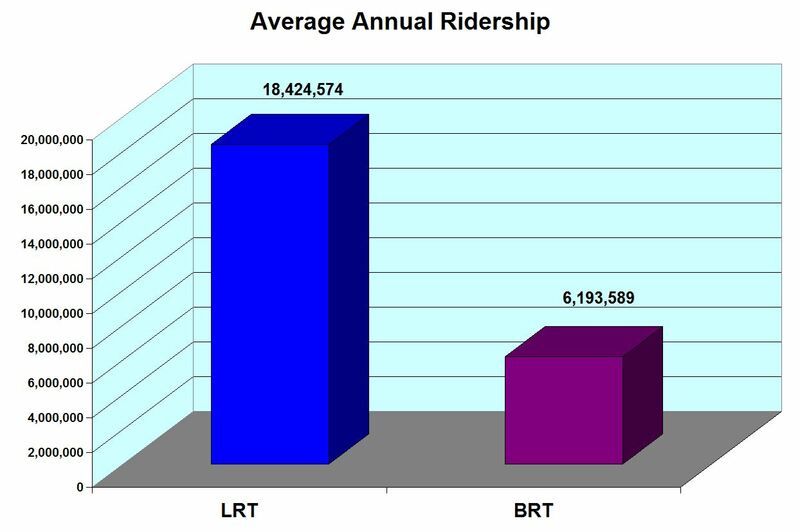 As Exhibit 1 indicates (below), in this comparison of similar installations LRT services attract approximately three times the average annual ridership of “BRT”. However, it should be noted that the majority of LRT systems have been operational longer than the “BRT” systems. Another important performance indicator is ridership per route-mile (or route-kilometer). This could be calculated from “Fixed Guideway Directional Route-Miles” in the NTD. Unfortunately, while these were available for LRT, none of the “BRT” systems presented this data in the 2013 report. Perhaps this data will be reported in future NTD reports. 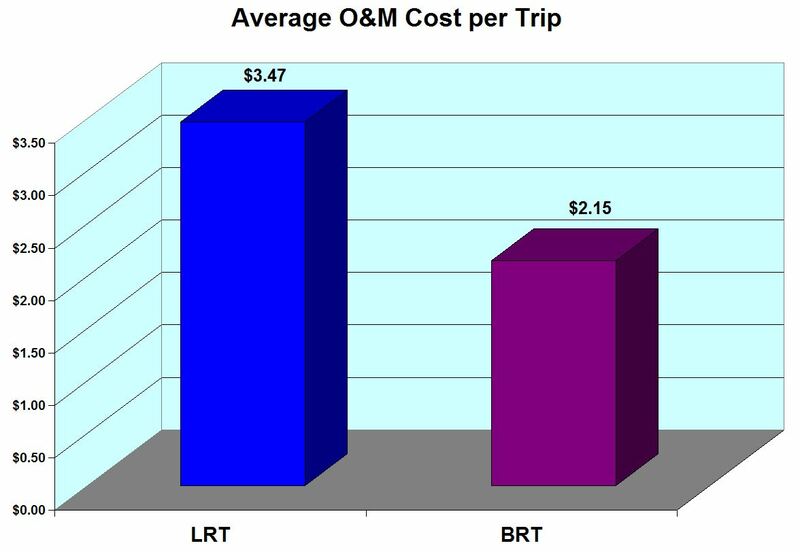 • O&M cost per rider-trip — In this important performance indicator, the “BRT” systems in this study averaged significantly better — 38% lower — than LRT, as shown in Exhibit 2. However, a drawback of this metric is that it fails to account for differences in average trip length, as discussed in the other performance indicators further below. Exhibit 2. Comparison of O&M cost per rider-trip. Another problem with this metric: While each agency’s LRT is a “closed” system (including virtually all costs, from platform operations to vehicle and way maintenance) with operational expenses compartmentalized and accounted for, “BRT” way maintenance accounting varies from agency to agency — sometimes funded by the transit agency, sometimes by the city or county in their public works budgets. Other “BRT” expenses, such as vehicle maintenance, may be blended with systemwide bus expenses. Likewise, while LRT security operations are almost always controlled and financially allocated to the LRT budget, for “BRT” this item may be hidden in systemwide costs. All told, there is really no consistency in how some “BRT” expenses are tallied and reported, thus affecting comparability to LRT costs. • Average trip length — Differences among modes may have different influences on passenger behavior and preferences, resulting in characteristically different average passenger trip lengths. This may also affect cost per passenger-mile. For example, the average O&M cost per trip of regional passenger rail operations is often compared disadvantageously with that of urban modes, including bus operations. However, the units cost per passenger-mile may be lower as longer trip lengths are factored in. 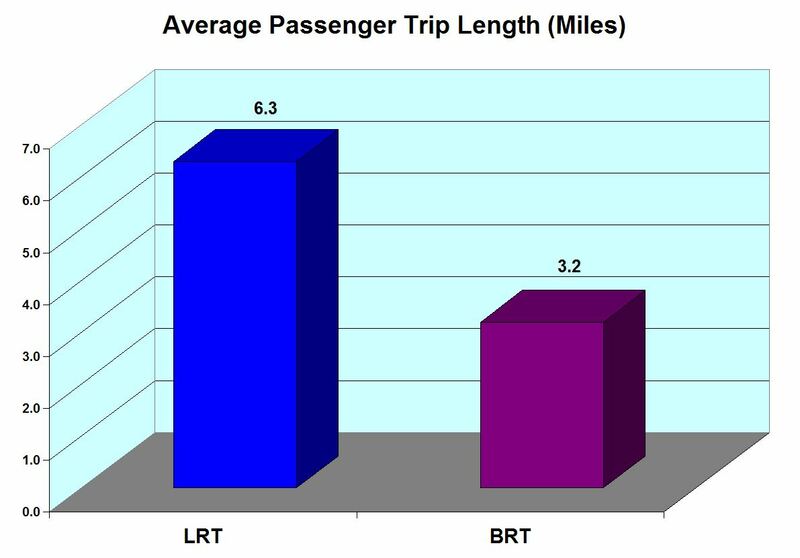 As illustrated in Exhibit 3, analysis of the 2013 ATD data indicates that comparable LRT systems attract passenger trip lengths almost exactly twice as long as the “BRT” systems in this study. Exhibit 3. Comparison of average passenger trip length. • O&M cost per passenger-mile — This unit-cost metric is by far the most important indicator for assessing financial performance, since it measures the actual work being performed — the actual transportation of passengers — rather than cost based on merely the number of “bodies” boarding the average transit vehicle. 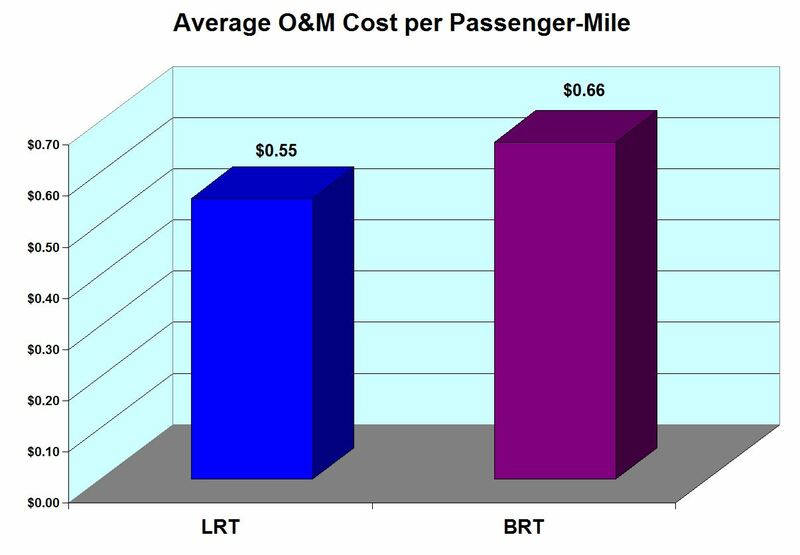 As shown in Exhibit 4, The LRT systems in this study averaged an O&M cost per passenger-mile approximately 17% lower than the “BRT” systems reported. Exhibit 4. Comparison of O&M cost per passenger-mile. NOTE: Since original publication, this post has been revised with a modification to the graph of cost per passenger-mile data (Exhibit 4). The original scale ($0.48 to $0.66) has been changed to $0.00 to $0.70 to reflect a minimum zero-value consistent with the other graphs. Also, in the discussion of O&M cost per rider-trip, a section has been added explaining the difficulty in accounting for some “BRT” expenses. Rev. 2015/07/02.